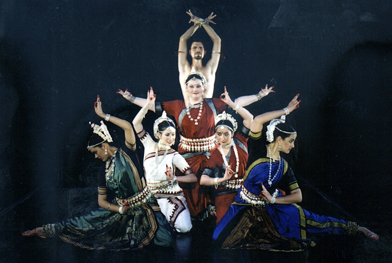 The dance style named variously as Orissi or Odissi developed in the eastern state of Orissa in India. One of eight distinct classical dance styles, Orissi has a long iconographical history, dating back to 2nd century B.C. The dance as performed today had to be reconstructed during the post-colonial era in the 20th century. The great masters of the reconstruction were Guru Pankaj Charan Das, Guru Kelu Charan Mohapatra, Guru Deba Prasad Das, Guru Mayadhar Raut, Guru Raghu Dutta, and Guru Mahadev Rout. Three distinct styles emerged: two from the gotipua tradition (young boys in female garb) and one from the mahari tradition (women�s spiritual). Both the mahari and the gotipua traditions and classical Orissi choreographies of Padmashri Guru Pankaj Charan Das and Padmabibhushan Guru Kelucharan Mohapatra are taught as a three-year curriculum at TESC. The Evergreen Odissi curriculum is a composite of the theoretical and practical aspects developed at the Bharatiya Kala Kendra in Delhi, the Utkal Sangeet Mahavidyalaya in Bhubaneswar, and the Orissa Dance Academy of Sri Gangadhar Pradhan. Dance performances at Evergreen College are both traditional and innovative with political themes from India and the US. Besides traditional Orissi performances once a year, every two years new choreography based on non-traditional themes or non-traditional presentations are performed at The Evergreen State College. Ratna Roy and Jamie Lynn Colley are the current faculty for the Orissi Dance program.